I will be going on vacation soon and will be mostly unplugged, so you will notice less frequent blog posts for a few weeks. I’ll cue up some Artful Devotions to be published automatically each Tuesday I’m gone but won’t be posting the links to the blog’s Twitter and Facebook pages as I usually do—so be sure to check the site instead! (Or subscribe by email by clicking the “Follow” link, located in the sidebar if viewing from your computer or at the bottom if viewing from your phone.) My regular publishing schedule will resume in September. A giant Red Sea fish swallows one of Pharaoh’s soldiers in this mosaic detail from the late Roman (ca. 5th century) synagogue at Huqoq, Israel. Photo: Jim Haberman, via UNC-Chapel Hill. KICKSTARTER CAMPAIGN: Songs for the Sojourn by Bellwether Arts: The same liturgical arts initiative that brought you this Advent/Christmas package is now poised to release a set of songs, visual art, and prose devotions inspired by the Bible’s “psalms of ascent,” which were likely sung by Jewish pilgrims as they ascended the road to Jerusalem for their three major annual festivals. At the head of the project is Bruce Benedict, founder of Cardiphonia, who in 2010 received a grant from the Calvin Institute of Christian Worship to commission songwriters and visual artists to help his congregation explore, through their respective disciplines, these fifteen psalms (read his application here). The project was so enriching to those involved that he recently decided to expand it to include even more songwriters, painters, and writers—the fruits of which are being made available to the public as a double-disc album, songbook, and art-filled devotional book. While the songs have been recorded, Bellwether needs your help to finance the mixing, mastering, and disc pressing and the printing of the other two products, as well as to pay the new artists involved. Pledging money in exchange for a reward (essentially, placing a preorder) is a tangible way to support the project. Visit their Kickstarter page for more information or to make a pledge. Campaign ends March 23. Help Higher Than the Hills (Psalm 123) by Aaron Collier. Photo courtesy Bellwether Arts/Cardiphonia. Psalm 133 by Kyle Ragsdale. Photo courtesy Bellwether Arts/Cardiphonia. SONG: “Refuse the Bait” by Liturgical Folk: Fr. Nelson Koscheski, Ryan Flanigan, and David Moffitt wrote this song last year about Christ overcoming Satan’s temptations in the wilderness. I’m always blessed by these men’s collaborations. To stay apprised of their latest, follow Liturgical Folk on Facebook, and see also https://liturgicalfolk.bandcamp.com/. FILM: Loving Vincent, dir. Dorota Kobiela and Hugh Welchman: The Oscars are the only occasion of the year that I watch live TV, and I’m really looking forward to the show this Sunday. One of the nominations for Best Animated Feature is the world’s first fully oil-painted feature film, Loving Vincent, a biographical drama about the mysterious Vincent van Gogh. While most reviewers say the narrative content is forgettable, they hail the film’s innovative production methods and visual achievement as nothing short of amazing. 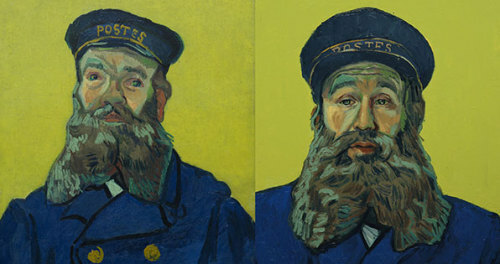 Funded by Kickstarter, a team of 125 classically trained artists from various countries painted 65,000 frames in the style of the Dutch master (many of the final canvas paintings were exhibited at the Noordbrabants Museum last year), and actors were cast who had a physical resemblance to van Gogh’s portrait subjects (e.g., Chris O’Dowd as Postman Roulin!). To view the paintings and learn more about the filmmaking process, visit LovingVincent.com, and see the trailer below. Rick Bartow (Wiyot, 1946–2016), After Van Gogh, 1992. Lead, wood, nails, crab claw, copper, and acrylic, 23 × 12 × 7 in. Private collection. Photo: Victoria Emily Jones. Also, I’ve been writing Lenten art reflections for GiftofLent.org, one for each Monday of the season (through March 25). This week’s is on Kris Martin’s Altar, a steel replica of the Ghent Altarpiece framework, installed on a Belgian beach. Click on the link to read more. Kris Martin (Dutch, 1972–), Altar, 2014. Steel, 17′4″ × 17′3″ × 6′7″. Temporary installation in Ostend, Belgium. Entire Bifrost Arts catalog available for free download: For a limited time, the Christian music collective Bifrost Arts is offering all forty-eight of their songs for free download from NoiseTrade. Donations are welcome—100 percent of them will go to the Salt and Light Artist fund, which funds residencies for Christian artists in Arab countries, providing a platform for interaction with the local arts community. Alternative song lyrics for “America, the Beautiful”: In 1993 Sister Miriam Therese Winter adapted the lyrics to “America, the Beautiful” to make the song more appropriate for a Christian worship service (i.e., less nationalistic). Her adaptation is #594 in the United Church of Christ’s New Century Hymnal. Interview with Bono and Eugene Peterson on the Psalms: This short film, released in April, documents the friendship between Bono (of the band U2) and Eugene Peterson (author of contemporary-language Bible translation The Message) revolving around their common interest in the Psalms. Inspired by their conversation, interviewer David Taylor compiled a list of resources for exploring the Psalms. Transforming a Protestant worship space into a Catholic one: The largest glass building in the world, the Crystal Cathedral in Orange County, California, has been undergoing renovations since having been sold in 2013 by the Reformed Church in America to the Roman Catholic Diocese of Orange. “Our charge is to convert an open, all-glass Evangelical church into a great Catholic cathedral to serve its centuries-old sacraments and ritual processions, and to reinforce the centrality of the Eucharist,” write architects Scott Johnson and Frank Clementi. This article published in Faith and Form describes some of the symbolic, aesthetic, environmental, and technical challenges of this project and includes renderings of the new space, which is scheduled to reopen next year. Top 25 films on mercy: I’ve been enjoying these top 25 film lists put together by the Arts & Faith online community—especially how they reach beyond the obvious choices, dipping into the silent era as well as non-American cinema. Here’s their latest, a list of films that “show us visions of a world so often lacking in mercy, as well as worlds in which one merciful act alters the landscape of human experience forever.” Click here to view their other lists: road films, horror films, divine comedies, films on marriage, and films on memory.